This Is Hunger, is a high-impact, experiential mobile installation designed to illuminate the profound prevalence of hunger in America, encourage us to raise our voices on behalf of the 42.2 million Americans who struggle with hunger every day, and spark a national commitment to end hunger once and for all. 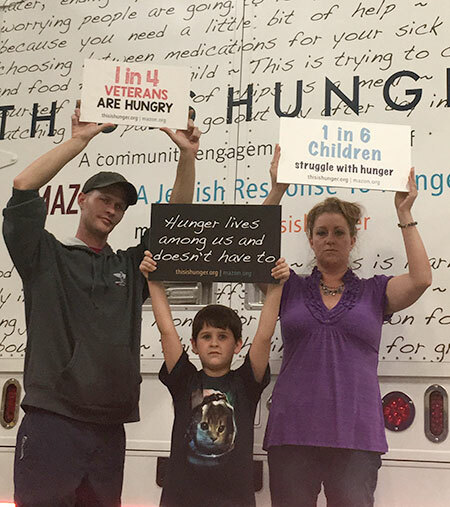 Housed within a 1,000 sq ft trailer, participants embark on a two-part immersive journey to understand the stark reality of hunger in America (ILLUMINATE) and engage with resources to learn more and take action (ADVOCATE). 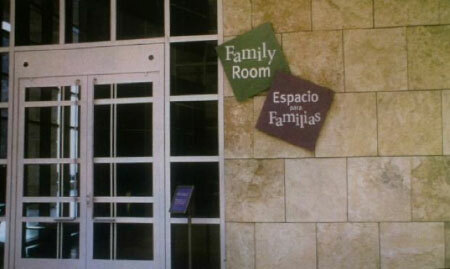 The most transformative project in the Autry's nearly 30-year history! Through immersive storytelling and nearly 20,000 square feet of gallery and garden spaces, California Continued shares how traditional ecological knowledge gained through centuries of experience can help present-day residents understand and care for the California environment. Two new exhibition galleries present extraordinary art, artifacts, and personal ephemera, including many objects from the Southwest Museum of the American Indian Collection on view for the very first time! Beyond the galleries, a new ethnobotanical garden features more than 60 Native plants and activities that explore how generations of peoples, especially First Californians, have made use of plants and water. Connecting and complementing each of the experiences, a dual-screen projection room reveals landscapes and close-ups across California, from deserts to the coasts. Selected as one of 15 commissioned artists. Glow is a unique, one-night, dusk-to-dawn cultural experience featuring original commissions that re-imagine Santa Monica Beach as a playground for thoughtful contemporary artworks engaging the public as both viewer and participant. Drawing upwards of 200,000 visitors, Glow is among the largest public art events in the U.S.
GLOWmasphere engages audiences of all ages in an immersive eco-art experience integrating movement, projection, percussion, heart and soul to activate the mood and grace of glowing. Participants become part of the installation itself amping up their own personal light from within to then pass on to others -- shining bright to be the light. A glowing 36’ geodesic dome entices your curiosity with an alluring array of light, color and shadow projections composed of moving figures and recycled objects. 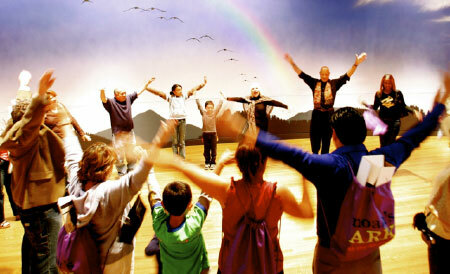 On the inside – it ignites you as participants are guided by dynamic facilitators. Every session is unique as are the participants. What does community have to do with it? Around the world, people with different kinds of expertise come together to create something special. 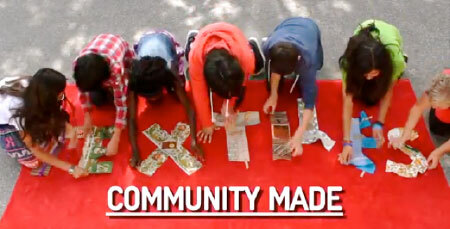 In this video, narrated by a group of tweens, learn about the collaborative process for making three different textiles from Japan, Cameroon and the United States. What inspires costume and textile artists? LACMA curators uncover how art made long-ago has sparked creativity for contemporary designers. Discover how paintings by an Italian monk inspired two sisters from Southern California to create a line of silk gowns, and how one designer's childhood visits to museums influenced her whimsical patterns. 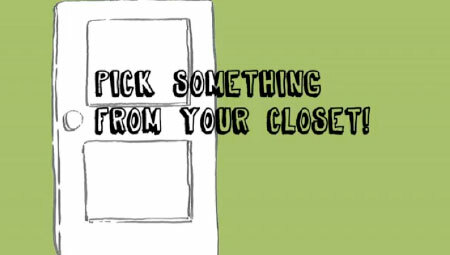 What does your closet at home have in common with LACMA? LACMA curators playfully reveal how fun and easy it is to make connections between what you'd find in a typical middle-school student's wardrobe and the museum's collection of costume and textiles. Ground breaking intergenerational family destination featuring immersive, experiential installations with an affective mission of building community and fostering citizenship. Recipient of THEA Award for Outstanding Exhibit Achievement and American Association of Museums, Award for Excellence. Responsible for developing storyline, concept, content and audience goals, giving vision and form to what would become the hands-on exhibit elements. Oversaw conception and launch of all Ark programming for inaugural year inclusive of school, after-school and public offerings. Breakthrough exhibit that literally invited children and their families to step into works by three great contemporary artists: Elizabeth Murray, William Wegman and Fred Wilson. Over two-dozen original works and interactive multi-media displays. Art Inside Out exposed families to the working processes of artists and provided a welcoming entry point into New York’s world of art and museums. Voted among the New York Times Best of 2002 top-10 list by Michael Kimmelman, chief art critic. Getty Center’s inaugural, hands-on discovery pavilion introducing an immersive, participatory approach to experiencing art for families. Custom created exhibits, arts and technology resources and interpretive materials to engage children and parents with the Getty collection. Responsible for the concept, content, exhibitry and programming for the Family pavillion, family programming, development of family audio tours, oversight of 90+ docents, gallery teachers and interns.